An Interview with Hara Kazuo on Sennan Asbestos Disaster – DOCU-YAMA LIVE! With Sennan Asbestos Disaster (2017), iconoclastic filmmaker Hara Kazuo makes a return ten years in the making, following his previous The Many Faces of Chika (2005). At three hours and thirty five minutes (usually screened with a short intermission), the film has many apparent differences from the past breathless titles for which he became known beginning in the early 1970s. Focused on a strong central protagonist pursuing a radical goal, these works depended on sustained conflict and collaboration between filmmaker and subject, defining a model of filmmaking he would theorize as “action documentary.” In contrast, this latest work is an ensemble piece assembled over a long period of time. Sennan Asbestos Disaster is focused on members of the Citizen Group for Sennan Asbestos Damage and their long legal battle that began with the filing of a lawsuit against the government in 2006 and went up to the Supreme Court. The Sennan district of the city of Osaka flourished thanks to the dense concentration of asbestos factories in the early twentieth century (hosting over 200 factories at its peak), despite the Japanese government’s knowledge of the material’s health risks through research conducted before the end of World War II. Many of those affected were workers migrating from the rural areas around Osaka, as well as ethnic Koreans living in Japan. Suffering from illnesses caused by inhaling the silicate mineral such as lung cancer, mesothelioma, and asbestosis, the plaintiffs and group members accuse the government of stunting regulation and prioritizing economic development over the well-being of vulnerable laborers and residents within range of the environmental toxin. Part One presents victims’ stories and history leading up to the case, while Part Two features the long, escalating drama of the court case, as plaintiffs pass away and the government repeatedly appeals the increasingly narrow victories decided by judges. Part of the historical significance of this case, following past instances of citizens suing corporations for liability, is that the defendant is the government itself, as is made clear in the original Japanese title 『ニッポン国 VS 泉南石綿村』, or “Japan vs. the Sennan Asbestos Village.” The significant stakes of the case also open up Sennan Asbestos Disaster as a continuation of Hara’s longstanding political commitments and formal approaches. Hara’s model of personal documentary developed in an era of leftist documentary collectives and justifies the penetration of private lives as a means of counteracting the state’s colonization of the self. In Goodbye CP (1972), Extreme Private Eros: Love Song 1974 (1974), The Emperor’s Naked Army Marches On (1987), and A Dedicated Life (1994), Hara and his subjects collide personal and social realities of disability rights activism, queer self-determination, military imperialism, wartime atrocity, traumatic repetition, and public deception and mortality. Sennan Asbestos Disaster reveals a voraciously curious filmmaker attentive to how new political and material environments and relations of subjects should be met with new creative methodologies. Here, a group of average citizens holding the state responsible for exposure to a deadly industrialized mineral instigates a stirring exploration of the brutality of capital, colonialism, and the state. Having collapsed the personal and political, in depicting the slow violence of the disaster in Sennan, Hara’s camera now tracks a poison seeping from the environment into human bodies. In October 2017, Sennan Asbestos Disaster had its World Premiere at the Yamagata International Documentary Film Festival, where it was awarded the Citizens’ Prize by the popular vote of attendees, and saw its International Premiere at the Busan International Film Festival, where it received the BIFF Mecenat Award for documentaries. I caught up with Hara at both festivals, and sat down to talk with him in the Haeundae neighborhood of Busan prior to the film’s Tokyo Premiere at Tokyo FILMeX International Film Festival in November. JOEL NEVILLE ANDERSON: When did you personally develop an interest in asbestos-related illness? HARA KAZUO: There was a time when I was making a television program about a film director named Urayama Kirio with a Kansai TV producer that I knew. That program turned out well, so we were hoping to work together again. We talked several times about doing different subjects, but nothing really came about until the producer suggested, “Well, how about doing something on asbestos?” That was the first introduction to the topic, from that producer. At that time, I’d spent about ten years reassessing my own work, and felt that, after having made films about people who’d lived very extreme lifestyles, I was finding it difficult to find a new topic, a new subject, and a person to focus on with a similarly intense way of living. I was thinking that maybe people who lived like that in the Showa period are no longer accepted in the Heisei era, and values have changed so much that that kind of intense, ferocious way of living isn’t accepted anymore. I couldn’t find a subject that really appealed to me until the asbestos topic came around, and I just felt like I wanted to make something—anything—so I latched on to that, and didn’t want to worry about whether it was appropriate or not. I just wanted to make something. Of course, being a TV company, I was hoping they’d come up with a budget as well, which they did. So that enabled me to break out of that funk of trying to find a subject matter similar to the films that I’d worked on previously. JNA: During the film’s premiere at the Yamagata International Documentary Film Festival, the question was asked whether or not the subjects in the film ever had any misgivings about the project. You had so many of the subjects there as guests, so there were many different views, and it’s great you were able to give voice to them. One woman stood up and said she never really had any doubts, and then Mr. Yuoka [Kazuyoshi] stood up and said, “Of course I had doubts, this is the director of The Emperor’s Naked Army Marches On!” But in the end he seemed happy with the final product. I’m wondering how you gained the trust of your subjects, and whether or not trust is all that important. HK: I’m not sure if I actually did gain their trust. I had this uncertainty about making this documentary about these people. They didn’t know me and they weren’t familiar with my work in the beginning, so there wasn’t any kind of image they had as to what kind of director I was, so that wasn’t really a problem at the time. I didn’t tell them. I didn’t hide it, but I presumed they had no interest since they weren’t cinephiles or documentary fans, and were just regular people, so I didn’t bother to give them an introduction to the kind of work I did. Kansai TV had made many documentaries on the subject of asbestos before, so they at first just treated it as one of them. The only thing was, with the Kansai TV documentaries, because it’s television, they need to be relatively up to date, made in the course of three or four months to screen shortly after so that the information stays fresh. But in my case, I was filming over the course of eight years, and just filming and filming and filming and never finishing, so it wasn’t until about two or three years into the shoot that one of the subjects asked me, “You’re the guy who did The Emperor’s Naked Army Marches On, aren’t you?” Nobody else really knew, but the word got out, and then [Sato Kenichi, a plaintiff] asked, “Could you show us—all of us—The Emperor’s Naked Army Marches On?” That was probably about three to four years into it, that request. I showed it to them, but afterwards their attitude didn’t really change toward me—they just continued on. A member of the legal team, Tani [Chieko], just a few days before Sato was about to die, asked me to film him, to show that footage in court of his suffering in his final days, and I ended up giving that footage to NHK to use as well. I felt a greater need to make this documentary because of that, a real importance to getting across the suffering they were going through. It took a long time to develop a rapport with them, especially people like Sato. When I was in my twenties and aiming to become a documentarian I came up with these two concepts of seikatsu-sha and hyogen-sha. The meaning of seikatsu is “life” and sha is “person,” so it has to do with lifestyle. Hyogen is “expression,” so hyogen-sha is someone who lives their life, and someone who expresses themselves or expresses something. My concept of seikatsu-sha was that of citizens and the general public, and people who live for their family and their family’s happiness, whereas hyogen-sha live for people in a wider sense, maybe poor people or victims of war, or people suffering in some way. They try to express their suffering and their difficulties to other people. I was more interested in making films about the lifestyles of people living really extreme or ferocious kinds of lives. I’d made four films in that sense, and I was searching for a new subject that would be equally intense, with a ferocious lifestyle, but I couldn’t find them. My whole thing was making films about strong people to make myself stronger as well, to hone myself and steel myself. So when the subject of asbestos came along, I remembered my origins and that way of thinking about seikatsu-sha and hyogen-sha. At first I thought I can’t make an interesting movie about just seikatsu-sha, about regular people, because everyone I’d made films about before had been very confrontational and lived in a very intense fashion. I felt that contradiction: I’d made films about this kind of people, and I’m now making films about regular people, who are still suffering, but they’re not particularly confrontational or anything like that. Nothing like Okuzaki Kenzo from The Emperor’s Naked Army Marches On. It wouldn’t be possible to get scenes of that nature out of them, they didn’t exist. They themselves didn’t value conflict, they were not the kind of people that sought it out. I spent eight years making it, not so much for the effort of trying to cover the entire movement, but just hoping that there would be someone or some event that would be similar to those previous films, that kind of conflict of an intense nature. But over that time the court case finished, and I couldn’t shoot anymore after it finished, because the movement ended. So I began editing. In the beginning, I thought two hours was the ideal time for a documentary. The first cut ended up being about two hours and sixteen or seventeen minutes. That version was screened for several days in Shibuya, mainly for fans and supporters—basically people who were happy to see my work, and viewing it in a positive light no matter what they really thought. So I was really uncertain. Is what I made really interesting? I wasn’t sure. Little by little people gave me their opinions of the film. Two or three regular people praised the film, but they were glad to see it, so obviously those sort of people would be nice to me as the sort of people who were looking to see me work, so I couldn’t trust that as a genuine appraisal of the film. One person said to me that it could be longer and it wouldn’t matter, that they’d like to see more. When I was editing the film, there were certain scenes that really struck me, but I left them out for editing purposes to get it to two hours. There were things that I wanted to put in, but I didn’t. That one person saying that it could be longer changed my way of thinking, and I decided to re-edit it, and spent another year re-editing the film. Of course I had to pay the editor again, the composer again; a lot of people weren’t very happy. At first I added just fifteen minutes. I showed it to the editor Hata [Takeshi], and he said, “Why don’t you just put everything in that you want?” That really took a weight off my shoulders. I can just make it as long as I like, and then that version was about four and a half hours, and Hata said that was way too long. I watched it many times, trying to figure out what to cut, then eventually got it down to about three hours and thirty-eight minutes. Of course we’d shot about six to seven hundred hours of footage. I think there were five hundred plaintiffs in the court case, but the film itself focused on about twenty people. With two hours, I was worried people would be upset with me for leaving things out, so ultimately we got it down to three hours and thirty-five minutes. 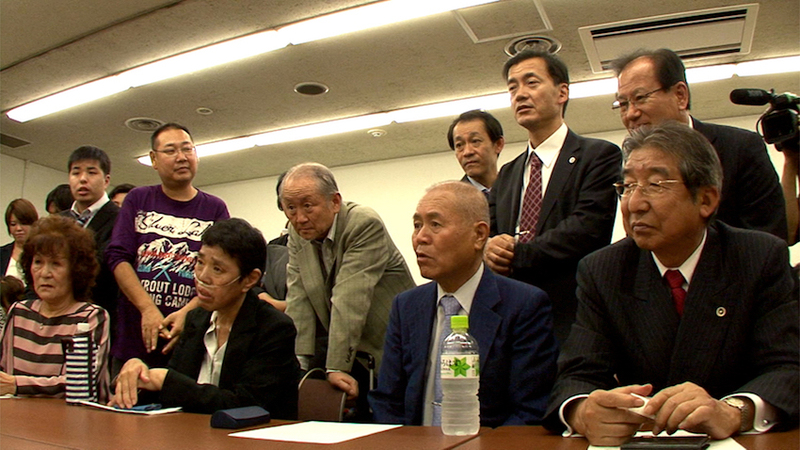 Then, right at the end of shooting there was an interview with Mr. Yuoka, where he was very critical of the other plaintiffs in the sense that he thought that they should confront the legal team with their anger instead of just going along with what the legal team said and reading the statements that were prepared for them. He felt that they should totally unleash their anger and express that in full. When I shot that interview I felt that finally, this was exactly the kind of content that I wanted. This was exactly the kind of “person-scene-comment” that matched my own way of thinking. It summarized what I was seeking. I was slightly relieved at that time, but I was still uncertain that what I’d made was interesting at the time of the first preview of the three-hours-and thirty-eight-minute version for the subjects of the documentary in Osaka. With the Minamata mercury poisoning controversy there was a whole dynamic within the people trying to get justice for the victims, with a split between the communists and the labor union, and that was often expressed in documentaries. In my film, the lawyers were kind of the equivalent of the labor union in the Minamata dispute, and Yuoka was more like the anti-labor union, agitated, intense side of the dynamic. I felt it was very important to express more of that conflict within the plaintiffs for the asbestos case as represented by Yuoka versus the legal team. I was concerned about the scenes that I had left out, but I was very surprised because they were okay with the version that I came up with, and they said to me, “Because it’s your film, we trust you. It’s our story, but it’s ultimately your work, so whatever you come up with, we’re happy with it.” I was very impressed by that: I saw them in a whole new light. Maybe I’ve underestimated these people, and they understand what I’ve done. So after that, there was a screening in Tokyo for about fifty people, mostly again fans and supporters of my work, people who were really looking forward to seeing it. I was still concerned with whether or not people would find the documentary interesting. The people at the screening in Tokyo said yes, but they’re fans and supporters so I couldn’t really trust them, and there’s that uncertainty again. Then there was the first screening for the general public in Yamagata. Of course the people there said nice things about it, but I couldn’t completely trust that either, until, walking around the venues, I’d meet eyes with people, or people would introduce themselves and smile and say, “Oh, it was a really interesting film,” and I thought, “Oh, I can trust that.” Even foreign people there came up to me and said the same thing, and I thought, “Oh, maybe I can trust that.” Then I thought, “Hang on, this is a screening in Japan, so people understand Japanese values and thinking so maybe people can appreciate it, and as a Japanese film it’s linked into those qualities, so people who understand that could appreciate it. But what about screening it overseas for foreigners? What would they think about it?” But by the second screening in Yamagata I felt a lot more relieved because there were laughs in quite a few places, so that was the first time—to a degree—that I felt I had made something interesting. But then, of course, there’s Busan, and I still feel uncertainty as to whether or not the film’s message will actually get across to people and they can fully appreciate it as the people in Yamagata did. At present I’m still filled with that same uncertainty as to whether overseas audiences will actually find the film interesting in any way. JNA: On the subject of certainty and uncertainty, the film presents a complex view of victimization and victimhood that you don’t often see in documentaries. For instance, you ask the widow of one of the victims of asbestos poisoning about her husband: “He was a good person, right? No drinking, no gambling?” And she answers, “Oh, actually, some gambling.” And you just drill in on those uncomfortable elements so that the victims become well-rounded characters. I wonder about that decision to drill in on the uncomfortable elements of victims’ lives, that for other filmmakers, is the first thing they would cut. HK: The question comes down to what a film is, and my answer comes from my mentors and predecessors, whom I asked many of the same questions, to figure out what a film should be. My personal view is formed by the views of two people, one of them being Imamura Shohei, who said that films should depict people. And what he means by that is: people are cowardly, they’re lecherous, they’re cheap, they’re immoral—and that’s what makes them interesting. So when you depict people, those are the aspects that you should depict, because it makes them more human. The other person is the director that I made the film about, Urayama Kirio, and he said that film is for the people. It’s for the proletariat, for the weak, the downtrodden. It’s not for the powerful. Many films exist as de facto PR films for the powerful, and those are not the kind of films that you should make. You should make films that try to make the lives of the downtrodden and the weak better, and bring happiness to them. Those two concepts basically formed my thinking of what film should be. Regarding Imamura’s view that films should depict people, I think that’s incredibly inadequate. It should be: films should depict people and their emotions. It’s not enough just to depict their qualities, you have to depict what what they love and what they hate, and that gives you a fuller view of their lives and what they’ve lived through and how they live. Also, more importantly, it gives you a view of the political system at that time. You can’t live separate from or be ignorant of the political system that you’re living in. Everyone is subjected to some form of suppression or control and experiences pain and sadness because of that. By digging into that sort of pain and hardness, that becomes a criticism of the negative points of that political system and what’s not working. Going back to my point about hyogen-sha, or people who express something, they have to be people who expose their own private weaknesses as well—the sort of thing that most people don’t want to show to other people. That in itself also exposes the contradictions within a society. The people who I made my previous films about were people prepared to open up and exposure themselves in that way, but this time, the people in the court case really had to become hyogen-sha in a way, because they had to show the suffering and difficulties they were going through even if they didn’t want other people to know, or were ashamed to show it; they had to, to get justice for themselves. But because they’re really seikatsu-sha—those people who live for their families—they don’t want to do that. They’re happy for you to show the movement, but anything beyond that, anything they’re ashamed of or embarrassed about showing, they don’t want you to show. Many people refused my requests to interview them and show their lives. For instance, there’s a mother in the film, living with her daughter, and the mother’s sick. The daughter is married and has children, and is looking after her. And because the mother is sick, she takes it out on the daughter sometimes. She’s feeling pain and is feeling ill, and is cranky toward the daughter and criticizing her. So her suffering because of the asbestos partially destroys that family relationship and the happiness they share together. By digging into that, you can show how asbestos has affected people, and caused suffering in that way. You can show more tangibly how the pain it causes can destroy families. I wanted to show them as hyogen-sha, but they weren’t happy about showing that. Of course there are praiseworthy things about the way that seikatsu-sha live their lives: they work very hard for the sake of their loved ones, and I’m not denying that or criticizing that. To get a more essential understanding of what they’re going through—their personal struggles and pain and sadness—they have to open up themselves, they have to expose themselves to a degree. That was an ongoing dilemma for me, trying to get them to do that, and trying to overcome that contradiction. In the sense of documentaries in general, if you just show good things about victims or people who are suffering, that’s a totally inadequate view of them as human beings. You don’t get a full understanding of those people and the life that they lived. There were about sixty people in the plaintiff group, and most of them refused to be part of the documentary. In my past documentary, The Emperor’s Naked Army Marches On, you have one protagonist, so you’ve got two hours to tell just his story, but with twenty-plus plaintiffs who agreed to be in the movie you have to show each of them in small scenes, and those small scenes have to show the essence of what they’re going through in their lives and their suffering. The way of doing that is to show the negative aspects of the conflict between them, lashing out at people, to get a fuller understanding of their suffering and the political context. Inevitably, if you ask questions carefully and dig into it, in the small scenes with all these people, you’re able to encapsulate their lives in a sense, in a concise way, by digging into those negative aspects, and it’s also more dramatic as well from a filmmaking perspective. Of course you also want to know, in their lives of sixty to seventy years, what the best aspects of their lives were, but you also want to know what the worst aspects of their lives were. So I don’t want to show people just as victims. I want to show them as people who have full lives of their own and emotions, for the reasons I said before, but also to elicit a response from the audience, whether that is sympathy for their struggle, or even a negative one of “No, I don’t agree with the way that person lives their life.” But at least you get a stronger connection by digging into those less savory aspects of the character, which actually show them more as human. JNA: In your book Cinema Obtrusa, you address some of these same ideas, and you talk about how in these four films that you mentioned previously—the “action documentaries” starring Yokota Hiroshi [Goodbye CP], Takeda Miyuki [Extreme Private Eros: Love Song 1974], Okuzaki Kenzo [The Emperor’s Naked Army Marches On], and Inoue Mitsuharu [A Dedicated Life]—you have very strong protagonists that you use as a way to pass from the public into the private, and by doing so, you are able to excavate internalized state power or self-colonization. You’ve talked about how you couldn’t find these kinds of protagonists any longer, and you’ve also talked about how you’d gotten over that stage in your filmmaking. My question is whether or not you see the methodology you took in this film, with a very long time period and many different characters, as a result of your personal development, or simply as necessary in view of the complications of environmental toxins which take place over a long period of time. Or is there a new kind of sociopolitical issue that you’re grappling with? I’m guessing it’s a combination of all three, but I’m wondering how you configure these elements. HK: With those first four films with strong protagonists, I didn’t really have any uncertainty about the methodology of how I should make them. It was rather clear. But I knew that that previous methodology wouldn’t work with this film. I’m not confident that I’ve found a new style, but conceptually speaking, I feel I need to change, not by locking myself in a room and contemplating it, but by dealing with subjects, confronting them, and shooting them, and taking on new subject matter, struggling to find the best way of presenting that and digging into it. In some ways, the protagonists of my first four films, although they were hyogen-sha, expressing themselves in what they do, in some way they were originally seikatsu-sha as well. So finding those elements of both hyogen-sha and seikatsu-sha is probably going to be an ongoing path of discovery from now on. The only thing I can do is to keep struggling, and keep dealing with lots of different subjects, and try and adapt my style for each one. In documentary, depicting victims of some kind is pretty much a constant, with the camera focusing on their suffering through some sickness or oppression. But recently I’ve come to wonder why that should be. Why always a victim? Instead, I’m more interested these days in the oppressors themselves, the people in power: what kind of faces are they making, what are they eating, what is their reason for doing what they’re doing? Ideally, I’d use the violence of the camera to strip them of artifice and the walls that they put up to find out why they seek power and why they actually possess power. To see them as seikatsu-sha in a way, as well. JNA: The issue of environmental toxins is very universal, especially as we see them intersect with natural disasters in Puerto Pico, or 3.11 in Japan with radiation. A big point in the film is the way in which the government caps the liability period up to the seventies, even though asbestos was used in Japan up to 2006. I’m wondering what you think is next for the case, and as a general question, since you seem very pessimistic about the justice system as just a way to protect the state and not the citizens, if you see, like Okada Yoko’s son in the film, that we’re all being strangled slowly by small degrees. HK: In the film, because of those limits, there were people, such as Okada and Iwanami, who were cut out of compensation, and after the screening yesterday there was interaction between victims from Japan and those from the Korean side, and the consensus seemed to be that there needs to be a movement around environmental toxins and environmental damage with asbestos in a campaign. That was the consensus, but not sure if that is going to work or not. More from a filmmaker’s perspective, what was really interesting is that I found out the asbestos processing machine from Sennan was exported to Korea, and they didn’t know who used it and where. Then there was word that it had gone on from Korea to somewhere in Asia, and I found out that it was very likely Indonesia. I wanted to ask the Korean side to find out more information and dig into the whereabouts of the machine now, and was told that it was very dangerous, and you could even put your life in danger doing that sort of thing. I found out yesterday that the machine from Sennan was brought to Korea by an ethnic Korean Japanese. Maybe a relative thought that they could make money that way, and the machine was brought to Korea. And then someone else thought, “Oh, we can make more money by taking it to Indonesia.” So people are still thinking they can make money from asbestos this way. It’s a fantastic story that needs to be told, and the fact that I couldn’t depict that in the film is rather frustrating, but of course that brings up the question: where do I get the money to continue reporting, and what happens to the other films I’m making? But I wish I would have been able to continue digging into this fascinating story. Interview conducted by Joel Neville Anderson in Busan on October 19, 2017, and interpreted by Don Brown. Special thanks to Kobayashi Sachiko, Kuroiwa Hisami, and Shimano Chihiro.